My husband and I are having some very hot nights! But not in a good way. Our bedroom is in the attic, on the side of the house that catches the sun. All day long. So by the time we go to bed it's like an oven in there. 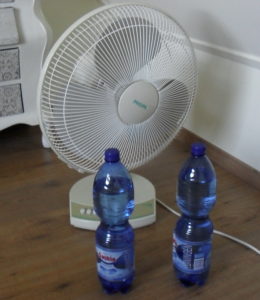 We don't have airconditioning so we use a ventilator to get some relief. But if I'm honest, all it does is blast us with more hot air. Then I got a great tip! I tried it last night, and I have to say: 'I think if kind of works!' At least I felt a tiny chill in the air coming from the ventilator! You can see our cheap air conditioner on the left. The picture was taken this morning, and all the water had melted. I'm going to put the bottles in the freezer again. Does anyone else have some frugal tips to cool down? That is a good tip! We have one of those fans that your can stick in the open window so it blows the cooler night air in the room from outside. That works when it gets cooler at night. It is so difficult to sleep when the room is too hot. Hope it cools down enough to get a good night's sleep soon!